These Fun, Free Web Applications Make it Quick and Easy to Create Cool Learning Content (Watch out Though, Other Teachers Will be Banging Down Your Door Looking for Tips). 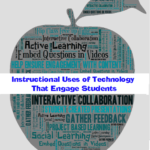 Do you know a teacher who just always seems to know about the latest technology, and makes it look so easy to produce cool content that students find fun and engaging? Maybe you are one of these teachers? 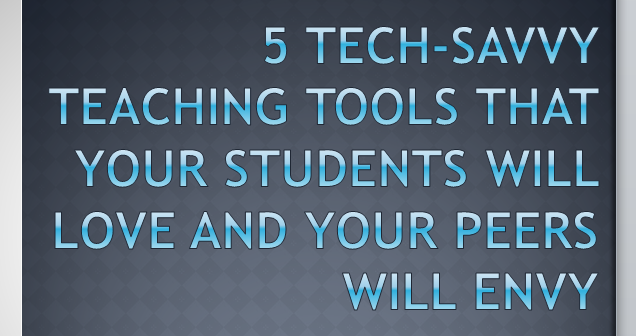 It doesn’t have to be hard to use slick tech tools in the classroom. There are so many free, easy to use tools out there. Here are five of my favorites to recommend. In addition to explaining the basic functionality of each tool, I’ve provided an example, and offered some thoughts on ‘ease of use’ and whether or not there is a paid plan (all of these tools have free offerings, one has a Premium Plan). Be patient with yourself if you try these for the first time and find yourself running into challenges. Some are really easy, and some are a little harder. Don't be too afraid to click stuff and see what happens. Sometimes you have to cast aside caution a bit and take a chance (and yes, sometimes that means you'll get tripped up, but more often you'll probably surprise yourself and figure it out!). If you have another favorite easy free tools to share, please drop a quick comment and share! Function: Create a slick tool for viewing a collection of web resources and other digital content. The best way to understand how the end result works is to check out the example below. Free vs Paid use: This is free and that’s all there is to it. Example: I created this Flipped Classroom professional development LessonPath when I first took the app out for a ride (it took me about 15 minutes). You can embed it, as you see here, or if you can use it directly on the LessonPaths site (and get a slightly more functional view). Function: Geddit provides an easy way for students to “check in” and indicate if they are comfortable with lessons sections as you move through them. This allows you to see at a glance how many students are struggling to understand material you are covering, allowing you focus on which material needs further focus. You can also ask specific questions. There are other applications that provide this functionality, but Geddit is one of the simpler ones I've seen. Of course, students need a device – this can be just about any computer, a tablet, or a smart phone, as long as it is has Internet access. I am confident that this kind of interactive student response system will become increasingly common, eventually becoming standard in many classrooms and schools. Ease of use: It is pretty simple to set up. I worked my way through setting up and trying my own lesson, making a simple question, downloading the app on my iPhone and signing up as a student and entering the course code for the class, and then going back and forth as the teacher and student asking for response (“check ins”), in about 20 minutes or so, but it could easily take a bit longer. I would advise allowing 45 minutes to an hour for figuring it out and working out the kinks. Free vs Paid use: Totally Free! Example: As a live interactive app, I can't really point you to a live example (it's not like web content). This video provides a look at functionality. Beyond that, to learn more … dive in at letsgeddit.com (click the Get Started Button). Function: The TedED tool lets you “Flip” any YouTube video. There are several sections where you can add resources, build a simple quiz, have a discussion, and then provide further links, etc., for a “Deeper Dive”. There are summaries available for each lesson, showing how many students have viewed lessons, answered questions, etc. This is a pretty awesome concept. Ease of use: Pretty easy to use (suggested time for first use: 30+ minutes). I love the thought behind this app, and it keeps improving, but I do have to forewarn that it seems like sometimes everything works great with it and sometimes it behaves sort of inconsistently. I have a slightly different experience just about every time I use it. Another slightly similar app is Tackk, but it doesn't have the quiz functionality or the structured additional content sections (you can have a discussion though, and provide additional resources). Free vs Paid use: Totally Free. Example: Here is an example of a video that was flipped with Ed.Ted.Com: http://ed.ted.com/on/5iMW5cFP. This is obviously a public lesson, but you can also choose to keep a lesson private and share it with only selected individuals via email. Ed Note: TES acquired Blendspace and the tool now lives here: https://www.tes.com/lessons. Example: This example has just 5 resources in it, but you can add many more to yours. It is also easier to view on the Blendspace web site: click here to access it in full screen mode, or click on the “Open in Blendspace” link in the upper right hand corner. Click on the circular icons on the upper right hand corner of each resource tile to open that resource within the Blendspace window. Function: Create a professional looking short video with ease using preexisting templates. It's pretty easy to create impressive videos with Powtoon. Ease of use: The template and tools make it pretty easy, but be prepared to spend some time laying your video out. Of course, you need to have some ideas about content. You can easily spend an hour with Powtoon the first time you use it, but the time is well spent, as the results are pretty impressive. Free vs Paid use: The Free version allows for only 5 minute videos, but there are paid versions starting at $19.99 a month which allow for 15 minutes videos. There are numerous other considerations with the free versus paid options. Click here to learn more. Example: I created this Powtoon to advertise the Flipped Classroom Workshop-in-a-Book. There are a wide variety of templates for educators and training, in addition to business and marketing and other content. I hope you find these as fun as I did. Be sure to tell us about some of your favorite free-but-powerful apps! Next articleGamifying the Classroom with Minecraft – so Many Fun Possibilities! Powtoon is giving away 50,000 FREE Classroom Accounts. Be quick offer expires on 31 October. Please note: I am in no way affiliated with Powtoon. Just an avid user. i use many websites for my presentation but powtoon is really awesome… thanks for sharing informative post. A great one for learning languages and vocabulary is the ‘Phrase Maze for Quizlet’ online/mobile game(free too!). It’s a fun game which has various modes with differing degrees of difficulty. It imports vocabulary from Quizlet lists (with optional pics), has TTS audio and tracks your progress. The Cathy, and “M” for the good feedback, and the info re: educator’s pricing discounts for Powtoon! Powtoon actually has an EDU account that’s $24 a year for instructors and $36 a year for the instructor and up to 60 students. They also have a 20% discount at the moment if you use the code “POW1” when you buy. I’m not affiliated with them in any way–just an avid user! Thanks for the introduction to Geddit! I’ve been chatting with the creators this morning and can see some really exciting potential for classroom use! Teachers who aren’t online just do. not. know. the kinds of amazing tips like this that they are missing…. In this case, finding a tool for getting student feedback on learning – included a way for students to add a comment or question without peer pressure stopping them – is such a cool find. In my area so few classes are rich enough to have clickers AND a smart board. Very exciting, Thanks! Hi Alice – Let us know what you think of LessonsPaths. I really thought it was one of the easiest yet most effective tools I’ve come across. In a matter of minutes you can create your own unique collection of content culled from the web and combined with your own content. The results are easy to share and easy to use. Enjoy! I’ve used TedED and I’m really liking the look of LessonPaths. I’m going to try it out this week. Also, thanks for incorporating the flipped material. Makes it easier to find those articles.